You're welcome, MuffyBee. I'm hoping for answers, too. Malaysia is still in the midst of discussions with Australia and China to engage a fourth vessel, "Fugro Supporter", to assist in the search for missing Malaysia Airlines (MAS) flight MH370. Transport Minister Datuk Seri Liow Tiong Lai said there was a need to deploy more equipments due to difficulties faced by the search mission in the southern Indian Ocean. He said there were currently three vessels involved in the operation, namely "Go Phoenix", "Fugro Discovery" and "Fugro Equator". A fourth ship will join the underwater search for missing Malaysia Airlines flight 370. The Joint Agency Co-ordination Centre said Fugro Supporter would join fellow ships Fugro Equator and Fugro Discovery in the Indian Ocean search zone later this month. Fugro Supporter has been equipped with a Kongsberg HUGIN 4500 autonomous underwater vehicle, which will scan parts that cannot be examined effectively by equipment on the other vessels. "It is not connected to the ship by cable, but is rather deployed with a pre-programmed area of the sea floor to investigate," JACC said. After each underwater mission, the vehicle will ascend automatically and return to the Fugro Supporter so the data can be downloaded and the vehicle's batteries changed. Fugro Equator and Fugro Discovery both departed Fremantle at the weekend and are expected to arrive back in the search area on Thursday. GO Phoenix left Fremantle on January 5 and recommenced its underwater search operations on Monday. If there are no major delays, investigators could finish scouring the priority zone by May. More than 200,000sq km have been surveyed and 14,000sq km of the sea floor have been searched. Fugro Equator is en route to the search area from Fremantle. The vessel is anticipated to arrive around 15 January. Fugro Discovery is en route to the search area from Fremantle. The vessel is anticipated to arrive around 15 January. GO Phoenix recommenced underwater search operations on 12 January. New search vessel, Fugro Supporter, is expected to arrive in the search area and commence search activities in late January. Fugro Equator completed bathymetric survey work on 17 December 2014 and returned to Fremantle for mobilisation to conduct underwater search operations. The vessel departed for the search area on 11 January and is expected to arrive around 15 January to commence underwater search operations. Fugro Discovery departed Fremantle on 10 January, and is anticipated to arrive in the search area around 15 January to recommence underwater search operations. GO Phoenix departed Fremantle on 5 January and returned to the search area, recommencing underwater search operations on 12 January. Fugro Supporter is expected to arrive in the search area and commence search activities in late January. Fugro Supporter has been equipped with a Kongsberg HUGIN 4500 autonomous underwater vehicle (AUV). The AUV will be used to scan those portions of the search area that cannot be searched effectively by the equipment on the other search vessels. It is not connected to the ship by cable, but is rather deployed with a pre-programmed area of the sea floor to investigate. After each underwater mission, the AUV will ascend automatically and return to the Fugro Supporter in order for the gathered data to be downloaded and the AUV's batteries to be changed out with a spare charged set. Both Fugro Equator and Fugro Discovery arrived in the search area on 15 January. Fugro Supporter has completed trials of the Autonomous Underwater Vehicle (AUV) and is travelling to the search area. Underwater search operations were suspended on 18 January, due to severe weather conditions associated with Tropical Cyclone Bansi. Fugro Equator and Fugro Discovery have since recommenced search operations. GO Phoenix is expected to resume in the next day or so. Around 16,000 square kilometres of the seafloor have been searched, which is around 26 per cent of the priority search area. The Australian agency leading the search for missing airliner MH370 is calling for expressions of interest for the recovery of the Malaysian jet, if it is found, Deputy Prime Minister Warren Truss said on Thursday. The Australian Transport Safety Bureau (ATSB), which is heading up the hunt in the remote Indian Ocean off western Australia, has so far scoured 26 per cent of the 60,000 square kilometre priority underwater search area. “While no wreckage from the missing aircraft has yet been found, preparations are being made so a recovery operation can be mobilised quickly and effectively when needed,” Truss said in a statement on Thursday. The expressions of interest are due February 18, a spokesman for Truss told AFP, with any recovery decisions to be jointly made by the Australian and Malaysian governments. 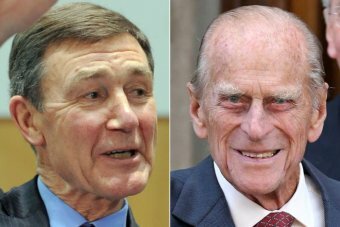 Former Defence Force chief Angus Houston and Prince Philip, Duke of Edinburgh, have been named as Australia's next knights. Prime Minister Tony Abbott announced Queen Elizabeth II accepted his recommendation that both men be awarded the country's top honour. Sir Angus, a retired Air Chief Marshal, said he was surprised and humbled by the honour. "I am still Angus Houston and most of the things I've been involved in have involved leadership, but I would be very quick to say that it's the people I've worked with that have delivered the outcomes that have been achieved," he said. He said his new title was a great honour but admitted he would prefer people continued to refer to him by his first name only. "I was very comfortable with who I am and what I am," he said. "It's a great honour to be recognised in this way but I'd like people to still call me Angus." In a statement, Mr Abbott praised Sir Angus for the continued commitment he had shown in serving Australia in various roles since finishing up as head of Defence. Those roles included investigating the disappearance of Malaysia Airlines flight MH370 and the shooting down of MH17 over Ukraine. "Successive governments have relied on Sir Angus's wisdom, judgment and character," Mr Abbott said. "Throughout his life, Sir Angus has put Australia first. "He immigrated to Australia as an adult, he chose Australia and we are much the better for it." Families and representatives of those on the aircraft that went missing on March 8 last year, said they were concerned about recent rumours that Malaysia was set to make a major announcement on the plane's disappearance tomorrow. "We have stated it before and reiterate again, that we are prepared for any eventuality, including the fact that our loved ones may never come back. "However, almost all families are unanimous in our stand that we do not want to declare our loved ones dead, without a shred of evidence," the support group called Voice 370, said in a press statement today. Civil aviation authorities in Malaysia will release a required report on the disappearance of Malaysia Airlines Flight 370 a day before the one-year anniversary, but it won't have any conclusion on what happened because the search is ongoing. The report to be released March 7 will focus on investigations into the search for the plane, which is believed to have crashed in the remote southern Indian Ocean, Deputy Transport Minister Aziz Kaprawi said Wednesday. The one-year report is required by the International Civil Aviation Organization. On 21 January, GO Phoenix recommenced search operations following the suspension caused by ex-Tropical Cyclone Bansi. Fugro Equator and Fugro Discovery continue underwater search operations. Fugro Supporter is anticipated to arrive in the search area in the next few days. Around 18,000 square kilometres of the seafloor have been searched. Around 18,000 square kilometres of the seafloor have been searched, which is around 30 per cent of the priority search area. Assuming no other significant delays with vessels, equipment or from the weather, the current underwater search area may be largely completed around May 2015. Investigators with Malaysia's Civil Aviation authority concluded the aircraft exhausted its fuel supply over the southern Indian Ocean and is on the seafloor. Everyone on the flight is presumed dead. An underwater search continues west of Perth, Australia. "It is with the heaviest heart and deepest sorrow that we officially declare Malaysia Airlines Flight MH370 an accident," Azharuddin Abdul Rahman, the director general of Malaysia's civil aviation department, said in a statement. The "declaration is by no means an end" to the search for the jet, a wide-bodied Boeing 777, he added. "At this juncture, there is no evidence to substantiate any speculations as to the cause of the accident." The Convention on International Civil Aviation, commonly referred to as the Chicago Convention, states that the definition of the term "accident" includes "the aircraft is missing," Azharuddin said in explaining the airline's announcement. "At this moment of sadness, the Chinese government expresses its deep sorrow for the misery of those on board, and offers its profound sympathies and sincere condolences to their families," Hua Chunying, the Chinese Foreign Ministry's spokesperson, said after Thursday's announcement. "We call on the Malaysian side to act on the commitments made in the statement, fulfill its obligation of compensation, protect the lawful rights and interests of the families and provide them with support and assistance," she said. "We also call on the Malaysian side to remain fully committed to the search and investigation efforts and keep the families updated on the latest progress." Malaysia on Thursday formally declared that the disappearance of Malaysia Airlines Flight 370 was an accident and all 239 people on board are presumed dead, a step intended to help victims’ families process compensation claims. The search for the Boeing Co. 777-200ER jet that disappeared on March 8, 2014 while en route to Beijing from Kuala Lumpur will continue, Azharuddin Abdul Rahman, the director general of the Department of Civil Aviation of Malaysia said. Australia is overseeing the search by private contractors. “Malaysia is committed to continue all reasonable efforts to bring closure to this unfortunate tragedy, with the continuing cooperation and assistance of the governments of China and Australia,” Mr. Azharuddin said. The declaration was made to satisfy legal requirements for the relatives of the victims so they can gain access to loved ones’ bank accounts, said Martin Eran-Tasker, technical director at the Association of Asia Pacific Airlines. “This is more for lawyers and courts, not for the families as they are going to accept none of this till there’s evidence,” said Mr. Eran-Tasker. The Australian Government acknowledged the declaration and issued a statement which can be viewed at http://www.jacc.gov.au/media/releases/2015/january/mr001_2015.aspx. The Chinese Government acknowledged the declaration and also issued a statement. On 3 February, GO Phoenix arrived at the port of Fremantle to conduct resupply operations. Fugro Equator, Fugro Discovery and Fugro Supporter have suspended search operations owing to the effects of two tropical cyclones in the Indian Ocean. Over 21,000 square kilometres of the seafloor have now been searched. Over 21,000 square kilometres of the seafloor have been searched, which is around 35 per cent of the priority search area. GO Phoenix suspended underwater search operations on 28 January in order to travel to Fremantle for a scheduled port visit, arriving on 3 February. Departure is scheduled for around 5 February. Fugro Equator is scheduled to suspend underwater search operations around 11 February in order to travel to Fremantle for a scheduled port visit. Fugro Discovery is scheduled to suspend underwater search operations around 12 February in order to travel to Fremantle for a scheduled port visit. Fugro Supporter arrived in the search area and commenced Autonomous Underwater Vehicle (AUV) operations on 29 January. To date three missions have been conducted in the southernmost portion of the search area. All three Fugro vessels ceased search operations on 1 February due to severe weather conditions, with wave heights in the search area predicted to reach 12 metres. The vessels are anticipated to recommence search operations around Thursday. GO Phoenix arrived in the search area and recommenced search operations on 10 February. Fugro Equator resumed underwater search operations on 5 February following the suspension of search operations due to weather conditions associated with Tropical Cyclones Diamondra and Eunice since 1 February. On 11 February the vessel departed the search area to conduct resupply in Fremantle. Fugro Discovery experienced some difficulties with its towfish communications after re-launching on 8 February. The towfish was recovered to deck once weather conditions permitted, repairs were undertaken and the underwater search then resumed. Fugro Supporter used a break in the weather to conduct an AUV mission on 6 February. The vessel resumed regular underwater search operations on 9 February. Over 22,000 square kilometres of the seafloor have now been searched. The underwater search is being carried out using two different types of subsea vehicles. GO Phoenix, Fugro Discovery and Fugro Equator are equipped with towed vehicles (towfish) equipped with synthetic aperture sonar, side scan sonar and multi-beam echo sounders. The vehicles are towed behind the vessel on very long cables (up to 10 kilometres) at an altitude between 100 and 150 metres above the sea floor. The length of tow cable deployed is used to control the altitude of the towfish. The sonar instruments on the towfish collect data which is relayed in real time to the vessels where it is processed and analysed to determine if there is any evidence of debris on the seafloor associated with MH370. ‘Dragon Prince’, the EdgeTech DT-1 towfish that is being used to search the seafloor for MH370, on the deck of Fugro Discovery. Source: ATSB, photo by ABIS Chris Beerens, RAN. Fugro Supporter is equipped with a Kongsberg HUGIN 4500 autonomous underwater vehicle (AUV). AUVs are self-propelled underwater vehicles (often shaped like a torpedo) which are very manoeuvrable. They can turn, ascend and descend rapidly to maintain a constant altitude above the seafloor in areas of challenging bottom topography. For this reason the HUGIN 4500 on Fugro Supporter is being used to search areas which are difficult or inefficient for the towed systems to search. The HUGIN 4500 AUV is equipped with instruments identical to the towfish on Fugro Discovery and Fugro Equator. The AUV is launched from the vessel, dives to the correct altitude above the seafloor and then spends up to 24 hours gathering sonar data in a pre-programmed search pattern. When the mission is complete, the AUV surfaces and is recovered by the vessel, where the data is downloaded and the batteries changed, ready for the next mission. The HUGIN 4500 AUV in the water. Source: ATSB, photo by Fugro. Prior to the commencement of the underwater search, the vessels and equipment were rigorously tested and this continues throughout the search. In the following interview, Mr Andy Sherrell, Quality Assurance Manager with the Australian Transport Safety Bureau, explains his role and some of the challenges presented by the search. An area of ocean floor the size of New Hampshire has now been searched in the hunt for missing Malaysia Airlines Flight MH370, authorities said Wednesday as they released new video demonstrating the sonar techniques being used in the operation. Over 9,200 square miles of the bottom of the southern Indian Ocean have now been searched without any sign of the Boeing 777, the Australia Transportation Safety Bureau said in an operational update. That represents about 40 percent of the total area to be searched, it said. "Assuming no other significant delays with vessels, equipment or from the weather, the current underwater search area may be largely completed around May 2015," it said. Geoscience Australia has produced a short video, ‘Mapping the deep ocean: Geoscience Australia and the search for MH370’. The video describes the key processes of bathymetric mapping and side scan sonar, which are used to gather data within the search area. There are three classifications for sonar contacts which are identified during the course of the underwater search. Classification 3 is assigned to sonar contacts that are of some interest as they stand out from their surroundings but have low probability of being significant to the search. Classification 2 sonar contacts are of comparatively more interest but are still unlikely to be significant to the search. Classification 1 sonar contacts are of high interest and warrant immediate further investigation. The underwater search so far has identified over a hundred seabed features that have been classified as category 3. There have been more than 10 features that have been classified as category 2. These objects may be manmade, but expert analysis of the imagery advises that none of them resemble an aircraft debris field. Rather, they have been isolated objects, some of which have the dimensions of shipping containers. To date, no seabed features have been classified as category 1. BEIJING — The three nations leading the search for Malaysia Airlines Flight MH370 will have to "go back to the drawing board," review all data and devise new plans if the plane hasn't been located by the end of May, Malaysia's transport minister said Saturday. Liow Tiong Lai said he remains "cautiously optimistic" the Boeing 777 is in a section of the southern Indian Ocean about 1,000 miles off the west coast of Australia, where an extensive underwater search — led by Malaysia, Australia and China — continues. 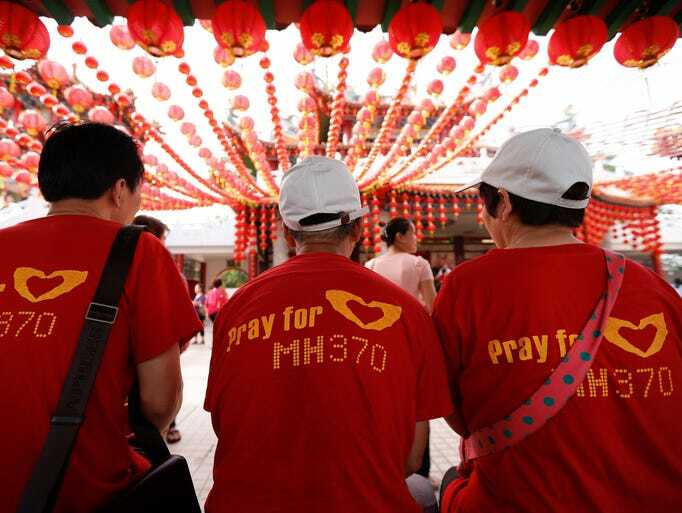 Lai spoke to a group of reporters in Kuala Lumpur on Saturday, a day before the first anniversary of the flight that left the Malaysian capital bound for Beijing on March 8, 2014. An interim report on the investigation — required by the U.N.'s International Civil Aviation Organization within a year of an accident — will be presented to Malaysian government officials Saturday and released to the public Sunday. With no breakthroughs to announce, the report is likely to detail the search process and reiterate the conclusions that led searchers to focus on the current search area, where four ships use sonar-emitting submersibles to scour the ocean floor. Although government officials from the countries involved in the search have repeatedly stressed their commitment to the hunt, Australian Prime Minister Tony Abbott warned Thursday, "I can't promise that the search will go on at this intensity forever." To mark the anniversary Sunday, Malaysia Airlines plans a private ceremony for staff and flight crew relatives at their headquarters. In Kuala Lumpur, passengers' relatives will hold a public commemorative event on Sunday afternoon.